In 2007, EducationQuest enhanced it services for younger students by launching the KnowHow2GO program in Nebraska. This program provides four steps 8th, 9th and 10th grade students should follow to make college a reality. See the KnowHow2GO section to learn about the four steps and about free KnowHow2GO resources for you and your students. 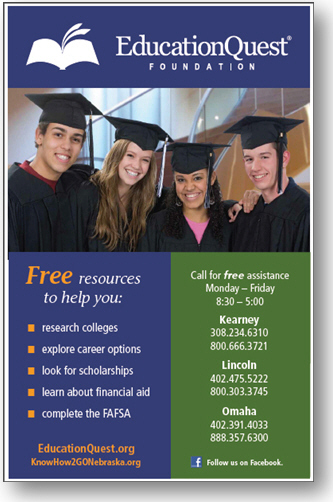 In 2010, EducationQuest and the Nebraska P-16 Initiative teamed up to coordinate the Go.Visit.College! campaign. This campaign encourages high schools and colleges to work together to coordinate group campus visits for high school students. It also encourages parents to coordinate campus visits for their student.